Rowlands Gill is a large village situated along the A694, between Winlaton Mill and Hamsterley Mill, on the north bank of the River Derwent, in the Metropolitan Borough of Gateshead, Tyne and Wear, England. Within Gateshead's greenbelt, the village has a picturesque setting with much open space and views across the valley to Gibside Estate, now owned by the National Trust. With the coming of the Derwent Valley Railway in 1867, Rowlands Gill became an economically viable coal mining village, and later a semi-rural dormitory suburb of commercial & industrial Tyneside. 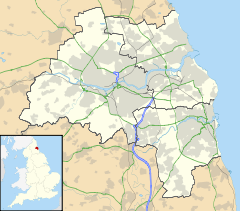 An independent village within Blaydon Urban District Council, in County Durham, it became incorporated into the County of Tyne and Wear and the Metropolitan Borough of Gateshead in 1974. In local government Rowlands Gill is located mainly within the ward of 'Chopwell and Rowlands Gill'. It is served by three councillors, all of whom are Labour councillors, except for the north end at Lockhaugh, which falls within the ward of Winlaton and High Spen, which is served by 2 Liberal Democrat councillors. Gateshead Council is Labour controlled. Rowlands Gill is in the parliamentary constituency of Blaydon. The MP is Labour's Liz Twist. Rowlands Gill is situated within Gateshead's Greenbelt, 6.2 miles southwest of Newcastle just outside of the Tyneside urban sprawl. Transport in the area is mainly focused on Buses as the nearest railway station is Blaydon railway station, 3 miles to the north, and is further away from any Tyne and Wear Metro stations. The village lies on the A694, known as 'Station Road' in the village centre. Another nearby major road is the A692 that passes through the nearby areas of Byermoor and Hobson, County Durham. The village has two licensed premises, the Vale of Derwent Working Mens Club and a ‘micro pub’, The Railway Tavern. The Towneley Arms Public House pre-dated the village, being built in 1835 to serve travellers and their horses on the turnpike road through the valley. It was rebuilt in 1961 and due to lack of business, demolished in 2002 and replaced with dwellings. Persons requiring alcoholic refreshment would need to visit any of the numerous licensed establishments in any of the nearby villages. The village has a four doctor GP surgery and a dentist surgery. There are two barbers, two hairdressers, two art shops, a gym, a post office, a grocer, a florist, a pet shop, a garage, and an appliance shop. Also, a bank, two estate agents, an accountant, a bookmaker and a mortician. There is an Italian restaurant, a Chinese restaurant/take-away, a tea-shop, and a fish and chip shop. A library is near the village centre. Strathmore Road Methodist Church and St. Barnabas Church of England Church are near the centre. There is a small summer season Caravan Park located on the municipal Derwent Park site. The Derwent Park provides access to the river where permit holders can fish; also there are tennis courts, putting, recreational fields and playground facilities. The Derwent Country Walk runs through the village along the route of the dis-used railway line. The A694 runs through the town. There are frequent bus services to Newcastle City Centre, the MetroCentre and, in the other direction, Blackhall Mill and Consett. Other minor bus routes such as UCall bus service operate. Rowlands Gill has a Primary School which was rebuilt in 2007 after the amalgamation of the previously separate infant and junior schools. The school is a feeder to Thorp Academy. However, a significant number of parents send their children to St Thomas More School. Rowlands Gill, and the surrounding Derwent Valley, was chosen by the Northern Kites Project as the location for the re-introduction of red kites in semi-rural areas. This scheme has proven to be a big success, with birds being spotted across the west of the borough, from Crawcrook through Rowlands Gill, to Burnopfield and Whickham. Kirsty Wade..athlete, is a former resident of the old station-masters house. Ben Satterly..wrestler currently under contract to the WWE. Was once billed as being from Rowlands Gill when wrestling in the North East. Wikimedia Commons has media related to Rowlands Gill. This page was last edited on 2 September 2018, at 11:53 (UTC).